If you forgot your passcode, or if a message says that your device is disabled, follow these steps to remove your passcode. 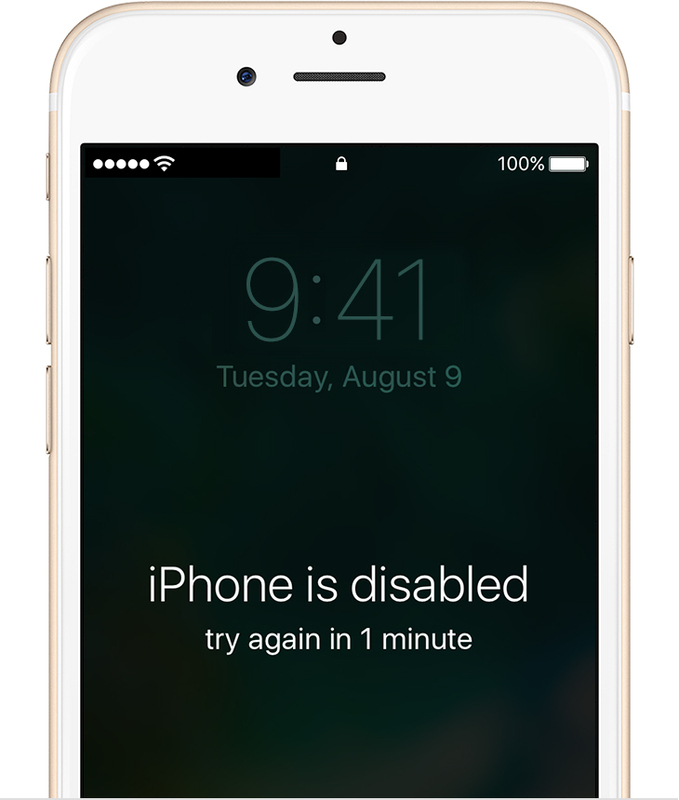 If you enter the wrong passcode on an iOS device six times in a row, you'll be locked out and a message will say that your device is disabled. Learn what to do. If you've synced with iTunes, use iTunes. If you're signed in to iCloud and Find My iPhone is enabled, use iCloud. If you don't use iCloud and you can't sync or connect with iTunes, use recovery mode. If you've synced your device with iTunes, you can restore your device. This will erase the device and its passcode. Open iTunes. If asked for a passcode, try another computer you've synced with, or use recovery mode. Wait for iTunes to sync your device and make a backup. If it doesn't, learn what to do. Once the sync and backup have finished, click Restore [your device]. If you set up Find My iPhone on your iOS device or Mac, you can use iCloud to erase and restore it. This will erase the device and its passcode. From another device, go to icloud.com/find. If your device isn't connected to a Wi-Fi or cellular network, you can't erase it with Find My iPhone. Connect your iOS device to your computer and open iTunes. If you don't have a computer, borrow one from a friend, or go to an Apple Retail Store or Apple Authorized Service Provider. On an iPhone 6s and earlier, iPad, or iPod touch: Press and hold the Sleep/Wake and Home buttons at the same time. Don't release when you see the Apple logo. Keep holding both buttons until you see the recovery mode screen. On an iPhone 7 or iPhone 7 Plus: Press and hold the Sleep/Wake and Volume Down buttons at the same time. Don't release when you see the Apple logo. Keep holding both buttons until you see the recovery mode screen.